I, Effing Feline, got left behind! I was all set to go. I got me some brand new duds: a tie and a top hat, and even a veil for my latest lady friend, too, hoping to score. But did Mr V take me to his nephew’s wedding this weekend? So I used The Midas Rush by Ed Hoornaert as a scratching post. Being a truly professional blogger, however, I’m giving you an unscratched snippet. Last week we met Tresky Buffrum, a naive young shepherd who gathered his life savings and trekked to his planet’s big city just two days prior. He is entertaining the most beautiful woman he’s ever met — alone in his hotel room, with a bed big enough for four people, six if they’re related. She said nothing, but at least she didn’t slap him. What has poor Tresky gotten himself into? I hope your wedding night had more warmth than his. What these two need are purring cats on their laps . All Tresky Buffrum wants is a taste of adventure and freedom before resigning himself to the simple life of a shepherd. What he gets instead is a mysterious wife, determined to remain chaste, who leads him to the Midas Crater, where some of the planet’s intelligent natives have been inexplicably transformed into gold. Can innocent Tresky defeat the interplanetary conspirators who seek to destroy the Midas Crater before its mysteries can liberate humankind? Very talented cat you got there, Ed. Want to loan him out??? Great excerpt. Poor Tresky. What did he get himself into? Loan? No. Rent? Maybe, maybe. He comes from a female dominated tribe in which women rule. He definitely doesn’t expect to be the leader of the marriage. Well you could always attend a masked ball for Halloween, Effing. You do look handsome, and your date is adorable. As to poor Tresky…I’m afraid my expectations are low for him as well. At least she seems willing to get him drunk first before…who knows what. Alas, Effing’s date didn’t appreciate getting dressed up (as you can tell from the picture), and when she heard she didn’t even get to go to the wedding, she broke up with him. Poor Effing. Tresky’s having a tough time with his new bride. She’s probably thinking good thing the bed is so big–they won’t have to touch each other. Lol. Those cats in the photo do not look happy. Oh, I think she has other things in mind for their wedding night. When a woman says she doesn’t want to speak first, that means trouble. Can’t wait to find out what kind he’d in! He’s in it up to his earlobes. Tresky is having one weird wedding night all right! Interesting snippet! Poor guy. It’s his first time in the ‘big city’, too. Oh dear. I’m sensing this isn’t a love match. I do love Tresky’s voice in this. I don’t know about that, Christina. Tresky seems pretty smitten with her. An awkward beginning to the honeymoon! These two could be on that TV show, Married at First Sight. Never mind Effing, I’m sure you will get your own back for being left behind. Hope you had a good time with your new girlfriend. When the man’s away, the cats will play, eh? Tresky Bufrum (what a fabulous name!) might end up getting more than the taste of adventure he was hoping for. Quite an intriguing story. Look forward to reading more. At the risk of sounding conceited, I gotta admit, I love the name Tresky Buffrum too. Poor Tresky. I don’t think she wants to get him drunk just to facilitate more talking. Not the kind of wedding night I’d want. Joyce, I’d worry about you if you DID want this kind of wedding night. This is hilarious. Don’t stop me. What a honeymoon. I want more, Please. So you like this kind of honeymoon, eh? See my response to Joyce immediately above. Married, to someone he met only yesterday? All is clearly not as it seems, and it can’t be good for Tresky! And the poor naive lunk suspects nothing. At least not yet. You’ll have to read pretty much the whole book to find out what she’s up to, I’m afraid. Wait a minute! I’m not afraid. I’d be delighted if you read the whole book. Now that is one strange wedding night. Perhaps it’s a good thing that the bed is so big! Thank you. It’s supposed to be strange, although after you’ve read a few pages you probably can guess what’s going on — though you’d be wrong. Yes, there is definitely something going on. I hope Tresky becomes aware of it before it’s too late. Poor Effing Feline. 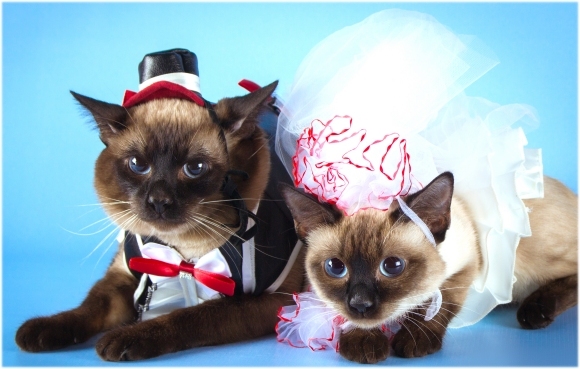 It’s takes a lot for a cat to get dressed up. Maybe Ed will learn when he finds The Midas Rush. It was a wedding on the beach at Ventura, California — a beach that allowed dogs. Effing would NOT have enjoyed himself. Poor Effing. But you may have gotten off better than you think. Churches are almost never a comfortable temperature, standing around is boring, and the food isn’t usually all that great. As for the snippet, sounds like she’s definitely trying to get him drunk. But why? As I said above — It was a wedding on the beach at Ventura, California — a beach that allowed dogs. Effing would NOT have enjoyed himself. Sorry you missed the bouquet toss, Effing. But a great snippet nonetheless! Let’s hope things take an upswing from this rather nutty wedding night! I hope my nephew had a better wedding night that Tresky’s. Wow! Did he go there looking to get married? It sounds like one of those one-night in Vegas deals, but without Elvis impersonators! I hope Tresky can find a way through this mess! Now I know what this scene is missing — an Elvis impersonator. He’s definitely not thought this through, and is getting a very chilly reception from his wife. I suspect she’s waiting for him to pass out and stop bothering her. Gosh, poor Tresky, his new bride does not want to talk to him about herself. But it does seem like she wants to hear what he has to say? Doesn’t everyone need purring cats in their laps? With the possible exception of people who are allergic to cats. Tresky might have a problem. Tresky definitely has a problem, as he finds out when he awakes the next morning. So he’s married to a woman he knows nothing about? Can’t wait to find out how he got into this situation. Not only does he know nothing about except that she’s pretty, she doesn’t want to tell him anything, either. I wouldn’t wish this wedding night on anyone, no. LOL re the last line. Wait, what, they’re married? I think I missed a detail. I didn’t see that coming. He is one nervous guy about his new bride. I wonder what they married for. And I gotta agree with P.T., she is definitely trying to get him drunk. You think maybe the shepherd is about to be fleeced? Between this story and the last one I took snippets from, there’s a pattern: a wily female outwitting a clueless male. Wine will definitely give you courage, but will there be regret in the morning? Regret? That depends what she ends up doing (or not doing) with him. They seem to have a lot of issues with the situation. I hope the wine will help but they might need a lot. It’s safe to say that this is a dysfunctional marriage. If you need a lot of wine to make a marriage work, do you really have a marriage?